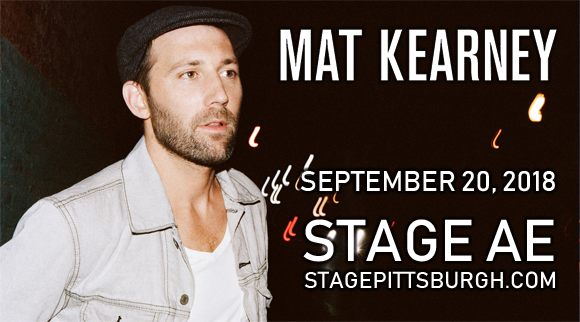 Multi-platinum-selling Nashville-based singer-songwriter Mat Kearney comes to Stage AE on Thursday 20th September 2018! Performing tracks from CrazyTalk, his recently released sixth studio LP, Kearney presents a new musical direction that sees him raising the bar and taking his talent to new heights! With the addition of support from Australian alt-rock band Atlas Genius, this will be one unforgettable show! Since making his debut in 2006 with the album Nothing Left to Lose, singer-songwriter Mat Kearney has made waves in both the Christian and secular charts, and has landed himself five top twenty hits on the Adult Top 40 Chart. His debut launched a title track that sold over 500,000 copies and earned Kearney several BMI awards, leading to tours with a variety of celebrated artists including John Mayer, Sheryl Crow, Train, Mutemath, Meiko, and Cary Brothers. Kearney's sixth and most recent studio album, CrazyTalk, was released in May 2018.